Cyber Monday, the Monday after Thanksgiving, turns the Black Friday shopping frenzy into a weekend-long affair. Just as with the in-store deals on Black Friday, shop your favorite retailers online for limited-time discounts on this unofficial holiday. But even Cyber Monday deals can be better with some clever deal-stacking! We’d be remiss to let you go shopping without a few extra tips for saving the most money. On top of already-enticing store discounts, save more money with coupons, rebates, free shipping and cash back on your online shopping. Follow these steps to turn your Cyber Monday deals into savings only a true Penny Hoarder could achieve. Start with knowing what’s worth buying on Cyber Monday. The online-only deals are often a way for smaller retailers, who can’t compete with the likes of Wal-Mart and Best Buy on Black Friday, to get in the game. Get your electronics and small gadget purchases out of the way on Black Friday. The deals tend to be better then. Save purchases of toys, clothing and travel for Cyber Monday. This is a great holiday for thrifty fashionistas! Make a list before you start shopping. Ads coming at you from all angles combined with the simplicity of clicking from store to store make overspending way too easy online. Creating a shopping list gives you a game plan to follow so you can ignore distractions, stay on track and keep your spending under control. Download our Holiday Shopping Worksheet to keep your shopping list, holiday budget and coupons organized in one place! Once you have your list, make sure you know the best place to buy everything on it. Planning ahead is key to getting the best deal. Deals are tough to follow any time of the year — that’s why we love deal aggregators. Follow our Cyber Monday Deals Site to keep track of deals throughout the day on November 30. When you’re ready to check out, choose your method of payment carefully. It could be a valuable decision. This can factor into which store is the best deal for the items on your list. What kind of bonuses or rewards will you get if you pay with a store’s branded credit card? You won’t collect points per purchase with this card, but you’ll get at least 12 coupons for discounts of 15-30% every year. Choose between 5% cash back or promotional financing. Also receive free shipping on orders of $35 or more, plus exclusive discounts, special sales and members-only events. While you’ll get no rewards and unremarkable discounts, this card can be useful if you’re working to build or fix your credit. It’s one of the easiest store credit cards to be approved for, and comes with perks like receiving a free monthly FICO score and cash withdrawals in store with no fees or interest. 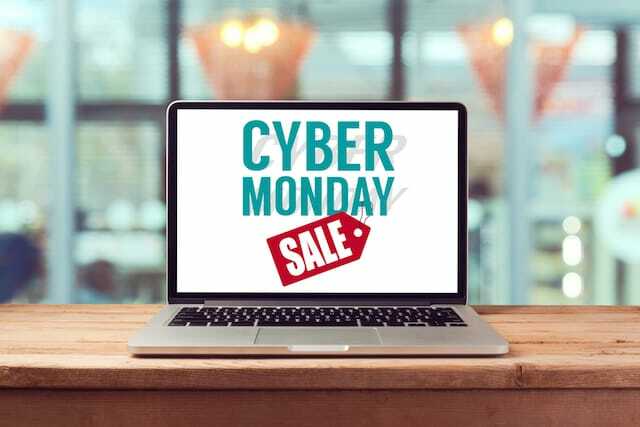 Planning ahead can help you save tons of money shopping on Cyber Monday, because you can get your hands on some discounted gift cards. Once you know what you want to buy and where you’ll buy it, visit Raise to purchase a gift card for that store. Sellers typically unload cards they got as gifts or ones they’re not interested in anymore, so you’ll pay less than the value of the card — an automatic discount on anything you buy with it! If you’re a big shopper, you can load up on cards from popular stores like Target, Best Buy or Amazon. Keep them organized with Gyft, so they’re easily accessible when you’re ready to pay. Use CostShredder to find which sites offer the best deal on gift cards for the store you want to shop. Do you have a cash-back credit card? If you budget well and pay off your balance each month, these can be a smart way to earn rewards for things you’re going to buy anyway. Compare the rewards you can earn by shopping on Cyber Monday with your cash-back credit card to savings from other payment methods. The credit card could be a better deal overall. Or, maybe you’ve been trying to save points for a trip or other bonuses. Cyber Monday shopping could be the push you need! If you pay with a credit or debit card, make your purchase do double duty by connecting the card with an auto-savings app — our favorite is Acorns. Then they invest the money into super-simple portfolios to help your money grow. It’s a cool way to make a little money while you shop — you probably won’t miss that loose change anyway, so why not put it to work? Anytime you shop online, you should take advantage of cash-back sites! Earn back some of the money you spend at every site — you’ll either earn direct cash or points to redeem for gift cards to top retailers. Even better, through Cashbackholic and CostShredder, you can find which rebate site is offering the best cash back for the store you’re shopping at. As a bonus, after the shopping frenzy dies down, you can “recycle” your savings by using the gift cards you earn through these sites to purchase more items on your holiday gift list. In addition to Cyber Monday discounts and killer rebates, you might be able to save even more by stacking coupons on top of deals. Many coupons exclude items that are already discounted, or can’t be used with any other deals or specials. Make sure you read the fine print before you start shopping. When you find a coupon that can be used regardless of other discounts, apply it at checkout to make Cyber Monday deals even better. Online shopping can offer some killer deals — until you get hit with shipping costs. Tack on an extra $5 or $10 to get an item to your door, and you could negate everything you’ve just saved! To avoid this extra expense, check out these 17 stores that offer free shipping — including some retail giants like Target, Dell and Nordstrom. Also remember: If you buy individual small items on Amazon — fewer than 8 ounces, smaller than 9 x 6 x 2 inches and less than $10 — you can get free shipping, even without a Prime membership. Once your shopping is done, open your Ibotta and Checkout51 apps to find additional rebates for anything you purchased. These apps are popular for the incredible savings they offer on groceries, but you can find deals on other retail items, as well. Check for cash back on your Cyber Monday purchases, and remember to enter the items when they arrive. You’re all set! Now that you know the steps to take for the best Cyber Monday deals, get organized. Download our Holiday Shopping Worksheet to get started planning your budget now. Dana Sitar (@danasitar) is a Staff Writer at The Penny Hoarder. She’s written for Huffington Post, Entrepreneur, Writer’s Digest and more. She’ll probably spend Cyber Monday week working on an elusive novel and eating ALL the leftover green bean casserole.